The Lemosho Route is often considered the most beautiful of all the trekking trails up Mount Kilimanjaro. It is one of the newer routes on the mountain and shares a portion of the same path as Machame route, although it holds a few advantages over that route that definitely make worth considering, particularly for travelers who have some extra time. Starting the western flanks of Mount Kilimanjaro at the Londorossi Gate, the Lemosho Route wanders its way up one of the more remote sections of the mountain. The trail takes hikers through a beautiful rainforest where they might have the chance to spot wildlife along the way. Black and white colobus monkeys are routinely seen in the forests, as are blue monkeys, small lizard and a wide assortment of birds. From there, the path wanders out onto the Shira Plateau, crossing it from west to east on relatively flat and easy to walk terrain. The early days on the Lemosho Route provides plenty of solitude, as this trail sees far less traffic than Machame route and Marangu route. This makes an already-great trekking adventure even more spectacular as at times it will feel like you have the entire mountain to yourself. Eventually however, Lemosho route merges with Machame route, and the amount of traffic begins to increase. But if you’re looking for a little peace and quiet in the early going of the climb, this is a great option. Because it follows the Machame Route for a portion of the climb, much of the same scenery is found on Lemosho route as well, including the Lava Tower and Barranco Wall. But, in those first few days this trail offers some unique views of the surrounding landscapes that aren’t visible from any other place on the mountain. Travelers will get the chance to wander through pristine rainforests and hike up to the Shira Plateau, where once above the tree line stunning vistas await. Because of its remote nature and lengthier route, Lemosho takes a few extra days to trek. Most people spend seven or eight days on this trail, which causes the success rate to increase fairly dramatically. If you’re looking to maximize your chances of reaching the top of the mountain, this is certainly one of the best options to choose, particularly over Machame route and Marangu route. Despite the higher success rate however, it should be noted that Lemosho route is a more strenuous hike than the “Whiskey” and “Coca-Cola” routes. There are certain sections of the trail that are steeper and more demanding, and of course trekkers spend an extra night or two sleeping in tents as well. Still, the advantages of this route truly make it stand out from the others, making it an increasingly popular choice for adventurous travelers. From your lodge, we will make our way to the Londorosi gate on the Western side of Mt. Kilimanjaro (a few hours drive from Arusha). We will begin our hike at the Lemosho trail head. Please note that in rainy/muddy conditions, sometimes the vehicles can’t make it to the true trailhead so there can be some extra hiking – After a picnic lunch, we will hike for about 4 hours to the forest camp. In the forest, exotic moss and flowers delight the eye while bird calls entertain the ear. You may see Black and White Colobus monkeys as well as signs of the elephants that travel in this area. We will overnight at Forest Camp. As we leave the Montane Forest and enter the Hagenia zone, our views open and we will catch our first views of the Kibo peak. This is a good acclimatization hike, as we go up and down several ridges along the way to our highest point of the day at 11,500’ before descending to camp. Overnight at Shira 1 Camp. 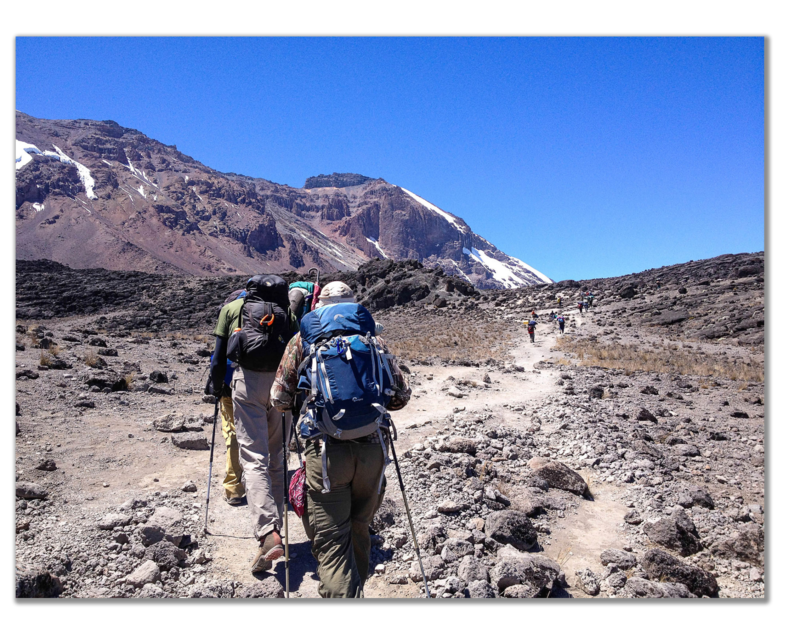 We leave the heath zone and enter the alpine zone as we hike 4-6 hours past Lava Camp (up to about 14,300’) with its volcanic landscape and then down a bit into the scenic Barranco Valley to camp. Hike about 3-5 hours to Barafu Camp, again with some ups and downs across small valleys. After settling into camp, we’ll have a demonstration on use of safety equipment such as the Gamow (hyperbaric) bag and oxygen. Early supper and rest in camp before your wake-up call to start your summit ascent around 11:00 PM or midnight. Summit day. We will start our ascent to the summit (19,340ft – 5,896m) around 11:00 PM or midnight the night prior. The goal for you – and numerous other climbers – is to reach the peak right at sunrise. In reality, due to differences in hiking speed, energy, and altitude acclimatization, there is a several hour span where most climbers reach the summit. Using headlamps (bring extra lithium batteries, which last much better in cold dark conditions!) you will ascend 6-7 hours to Stella Point and then another 1-2 hours to Uhuru Peak, the summit. After a summit celebration and photo, descend to Barafu camp for lunch and then to Mweka camp to sleep overnight. We make the final descent to the trailhead today, about 3-5 hours hiking. Here we will have lunch and say goodbye to our mountain crew before leaving Mount Kilimanjaro and heading back to town. Arrive at your lodge usually between 3-5 PM. The questions and answers below are specific to the Lemosho route. How difficult is the lemosho Route? The Lemosho route is considered one of the easiest routes on Kilimanjaro as it’s longer itinerary allows for better acclimatization. However, hikers will still need to ascend the Barranco Wall and climb steeply on summit night. No technical climbing is required but a good level of fitness is highly recommended. What is the distance of the Lemosho Route and how many days does it take? The exact trekking distance for the Lemosho Route is 71km or 43 miles. 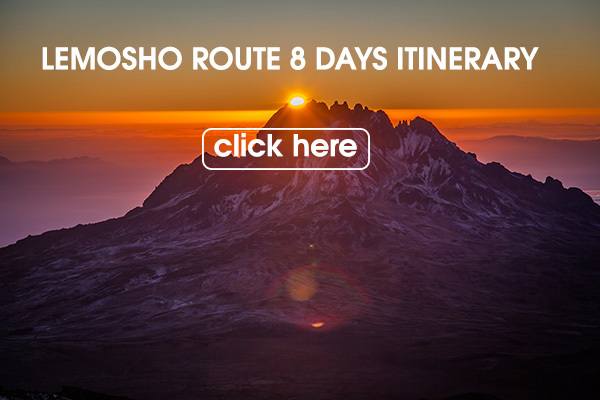 The shortest number of days required for Lemosho Route is 7 days, but by the time you have added on arrival and departure days it is 10. However, as it is a much longer approach route it is actually best done over 8 or 9 days to increase your changes of success. 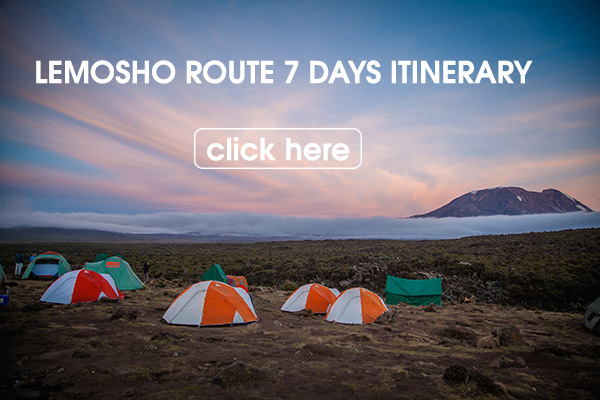 What is the Lemosho Route Summit Success Rate? What is the Scenery like on the Lemosho Route? The Lemosho Route is considered to be the most scenically beautiful of all the routes. The route takes trekkers from the west side of the mountain through lush rainforest before joining up with the Lemosho Route to cross the spectacular Shira Plateau. The route takes in the west and south of the mountain and the views are incredible, particularly from on the southern circuit.